All planters will hold plants though some are better than others and some more attractive than others. A lot depends on the climate you live in. Some materials appear to be tough but then shatter in the first frost. 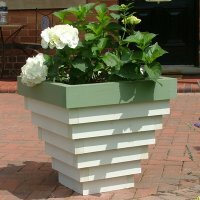 Available in a host of new and traditional materials, the choice of garden planters has never been better. The surge in small space living and a desire for instant success has renewed peoples interest in garden planters. This in turn has led to a huge innovations in planter design and use of materials from which they are made. Traditional garden planter materials like terracotta and stone are being used to create modern adventurous designs, while experiments with new materials like moulded resin have given rise to an unprecedented choice of planters. There is now a style, shape, size and colour of planter for every gardening situation and, if what you want doesn’t exist, a one off planter or group of planters can be commissioned at an affordable rate, such variety of planters give ample scope for innovation and indulgence. 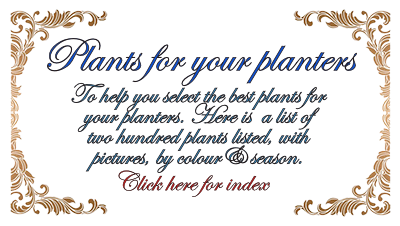 There are a mixture of both practical and aesthetic decisions to be made when selecting the best planter for your needs. Wooden planters have a natural appeal but unless they are hardwoods, like oak, they will need regular maintenance to prevent them from deteriorating in the wet. Like wood, terracotta, has a natural affinity with plant material and looks good when teamed up with most plant combinations. But terracotta is porous and dries out more quickly so plants in terracotta planters need more frequent watering. Metal planters create a clean, pared down contemporary look and their hard surfaces are easy to clean. Terrazzo and some synthetic planters create the same visual effect as metal with their simple designs. There are also now some very good synthetic copies of lead cisterns and large terracotta pots which can achieve a grand effect on a budget.